The Maremma Sheepdog or Maremmano-Abruzzese Sheepdog (Italian: Cane da pastore Maremmano-Abruzzese), usually referred to simply as the Maremmano or Abruzzese Sheepdog, is a breed of livestock guardian dog indigenous to central Italy, particularly to Abruzzo and the Maremma region of Tuscany and Lazio. It has been used for centuries by Italian shepherds to guard sheep from wolves. The literal English translation of the name is "The dog of the shepherds of the Maremma and Abruzzese region". The English name of the breed derives from that of the Maremma marshlands, where, until recently, shepherds, dogs and hundreds of thousands of sheep over-wintered, and where the breed is today abundant although sheep-farming has decreased substantially. The breed is widely employed in Abruzzo, where sheep herding remains vital to the rural economy and the wolf remains an active and protected predator. Similar breeds include the Pyrenean Mountain Dog, the Kuvasz of Hungary, the Tatra of Poland, the Cuvac of Slovakia and the Šarplaninac (although not white), with all of which it may share a common ancestor; and the Akbash Dog of Turkey. Hunting the Wolf by Jean-Baptiste Oudry, 1746, from the collection of Louis XV; the dogs to the left and right of the wolf are described in a catalogue of the museum as "large dog[s] with long hair". Wolf dogs from the Abruzzo were imported into France at about this time. They were used by François Antoine, "Antoine de Beauterne", in his successful hunt for the Beast of Gévaudan in 1765; according to Gobin, under Louis XV (r.1715–1774) the Venerie Royale or Royal Hunt was composed in large part of Abruzzese wolf-dogs and Sicilian mastiffs. The first registration of the Maremmano in the Libro delle Origini Italiano of the Kennel Club Italiano, as it was then called, was of four dogs in 1898. There were no further registrations for many years. In 1940 there were 17 dogs registered. The first standard for the breed was drawn up in 1924 by Luigi Groppi and Giuseppe Solaro. Until 1958 the Pastore Maremmano, or shepherd dog of the Maremma, and the Pastore Abruzzese, or shepherd dog of the Abruzzi, were regarded as separate breeds. A breeder's society for the Pastore Abruzzese was formed in 1950, and one for the Maremmano in 1953. On 1 January 1958 the breeds were unified by the ENCI, the Ente Nazionale della Cinofilia Italiano, the national dog association of Italy. The explanation given is that a "natural fusion" of the two types had occurred as a result of movement of the dogs due to transhumance of sheep flocks from one region to another, particularly after the unification of Italy. Until 1860, the mountains of the Abruzzo and the plains of the Maremma lay in different countries. As sheep farming developed into an annual trek or transhumance from mountain grasslands of Abruzzo and Molise (and other parts of central Italy) south to lower pasture land in Puglia where sheep were over-wintered, the dogs came to play a central role in the centuries-old migration, an annual event vital to Abruzzese culture. Maremmano dogs continue to be widely used by Italian sheep farmers in areas where predation is common, such as the Apennines of central Italy and the open range land of national parks in Abruzzo. Besides their wide use in Italy, Maremma Sheepdogs are extensively used as livestock guardian dogs in Australia, Canada and the United States. The Maremmano has a solid, muscular build, a thick white coat, a large head and a black nose. According to the breed standard, males should weigh 35 to 45 kilograms (77 to 99 lb) and stand 65 to 73 centimetres (26 to 29 in) at the shoulder, while females weigh 30 to 40 kilograms (66 to 88 lb) and stand 60 to 68 centimetres (24 to 27 in). Some dogs may be considerably larger. The coat is long and thick; it is rough to the touch, and forms a thick collar around the neck. It should be solid white; some minor yellowing may be tolerated. 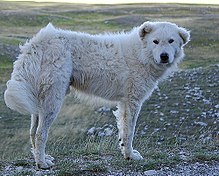 The traditional use of the Maremma sheepdog is as a guardian for the protection of sheep flocks against wolves. Columella, writing in the first century AD, recommends white dogs for this purpose, as the shepherd can easily distinguish them from the wolf, while Varro suggests that white dogs have a "lion-like aspect" in the dark. The dogs work in groups; three or four dogs are an adequate defense against wolves and stray dogs. Their function is mostly one of dissuasion, actual physical combat with the predator being relatively rare. 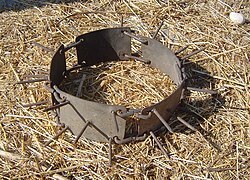 Nevertheless, working dogs may be fitted with a roccale (or vreccale), a spiked iron collar which protects the neck in combat. The ears of working dogs are normally cropped. Maremma used as livestock guardian dogs are introduced to sheep flocks as puppies so they bond to the sheep. Some ranchers place Maremma puppies as young as 3–4 weeks old with young lambs, but beginning this bonding process at 7–8 weeks is more typical. Although it is easiest to bond Maremma to sheep and goats, cattle ranchers have found that the dogs bond with cows and Maremma are increasingly used to protect range cattle. Some ranchers have successfully trained Maremmas to protect free-range fowl, such as chickens, from predation from both ground threats such as coyotes, stray dogs and foxes as well as aerial threats such as raptors (hawks, eagles, owls, etc.). In Warrnambool, Australia, the world's first trial using a Maremma to guard a dwindling little penguin population on Middle Island  against fox attack, commenced in 2006. This project won the 2010 Australian Government Coastcare Award. While using Maremma to guard an endangered species is rare, Maremma along with other breeds of livestock guarding dogs are appreciated by environmentalists because they make it possible for livestock to co-exist with predators such as wolves and coyotes, reducing their predation by 70% to 80% or more. Wikimedia Commons has media related to Cane da pastore Maremmano-Abruzzese. ^ Barker, Graeme; Tom Rasmussen (2000). The Etruscans. Wiley-Blackwell. p. 33. ^ Ancona, George (1985). Sheep Dog (1st ed.). New York: Lothrop, Lee & Shepard. ISBN 9780688041199. ^ [https://web.archive.org/web/20160825233508/http://www.cpma.it/lavoro.php?a1=2 Le Origini del cane Pastore - Maremmano Abruzzese (in Italian). Circolo del Pastore Maremmano - Abruzzese. Archived 25 August 2016. ^ a b c Breber, Paolo (1983) Il Cane da Pastore Maremmano-Abruzzese 2nd edition. Firenze: Olimpia (in Italian) "The Maremmano-Abruzzese shepherd dog"
^ Franco Simoni (1987). "Storia ed etimologia" (in Italian), in: Fiorenzo Fiorone (1987). I pastori italiani: il maremmano-abruzzese e il bergamasco. Milano: De Vecchi Editore. ISBN 978-88-412-2316-1. ^ Standard del cane da pastore maremmano abruzzese (in Italian). Ente Nazionale dell Cinofilia Italiana. Archived 22 June 2016. ^ Cane da pastore Maremmano Abruzzese - Lo Standard (in Italian). Circolo del Pastore Maremmano - Abruzzese. Archived 31 October 2017. ^ cited in: Lorna Coppinger and Raymond Coppinger, Dogs: A New Understanding of Canine Origin, Behavior and Evolution (2002), University of Chicago Press, ISBN 0-226-11563-1, page 120. ^ Caratteristiche del Cane da difesa del gregge (in Italian). Circolo del Pastore Maremmano - Abruzzese. Archived 5 November 2013. ^ Coppinger, R. and L. Coppinger. 1995. Interaction between livestock guarding dogs and wolves. Pages 523–526 in L.N. Carbyn, S.H. Fritts and D.R. Seip, editors. Wolves in a changing world. Canadian Circumpolar Institute, Edmonton, Alberta, Canada.